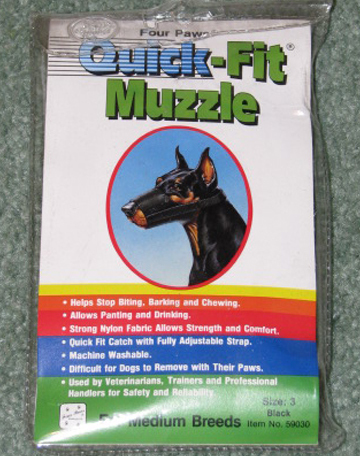 Quick-Fit Muzzle for dogs. Helps stop biting, barking and chewing while allowing the dog to pant and dring. It is made of strong nylon fabric which is strong and comfortable. The muzzle comes with a fully adjustable strap. It is machine washable and difficult for the dogs to remove with there paws. It is used by veterinarians, trainers and professional handlers and made for safety and reliablility. The Quick-Fit Muzzle comes in 9 convenient sizes. Size 0 - for Tiny dogs - Cavaliers, Miniature Dachshunds, Miniature Poodles, Yorkies. Size 1 - Jack Russels, King Charles, Spaniels, Pugs Standard Dachshunds, Westies, Whippets. Size 2 - Beagles, Border Collies, Cocker Spaniels, Springers, Standard Poodles, Dobermans. Size 3 - Bull Terriers, Dobermans, German Shepherds, Lagradors, Retrievers, Stters, Staffordshires. Size 3XL - Boxer type breeds with short snouts. Size 4 - Large Dogs - Bloodhounds, Danes Pyreneans, St. Bernards, Wolfhounds. Size 4XL - For estra large dogs that are listed in 4 above. Size 5 - Bull Mastiffs, Rottweilers. Size 5 XL For extra large dogs that are listed in 5 above.